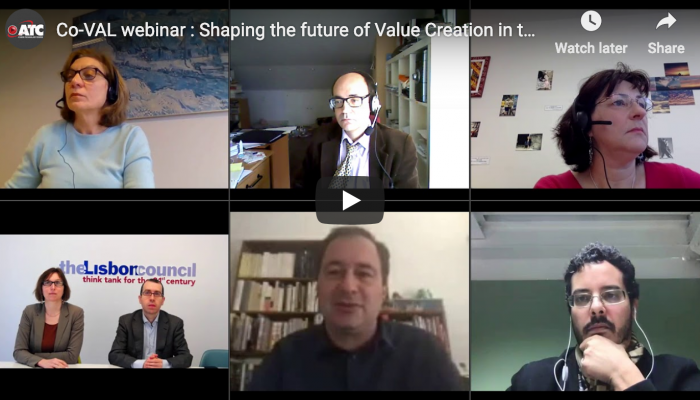 At the Co-VAL High-Level Webinar on Government Transformation: How ‘Co-Creation’ Will Shape the Future of Value Creation in the Public Sector, Miguel Alvarez Rodriguez, programme manager for the ISA2programme at the European Commission’s DG informatics (DIGIT), shared early findings of The 10thAnniversary e-Government Factsheets Report. The report is now available and compiles 10 years of data about e-Government strategies, legal frameworks, key actors managing public service delivery, technical infrastructure and services in 34 European countries. Among others, it shows that nine countries claim the adoption of ICT-friendly laws is one of their main achievements in the e-Government field in the past decade. Also, the delivery of digital public services at the local level is mentioned as a crucial element to take into account in a digital transformation agenda, as stressed in Co-VAL’s policy brief by Lisbon Council Director of Research David Osimo, entitled How Local Government Reform is Key to Europe’s Digital Success: A Six-Point Programme for eGovernment Renewal. The 10thAnniversary e-Government Factsheets Report is full of best practices and lessons learned from around the European Union and further and represents an interesting tool for administrations that wish to deepen their digital transformation strategies.